A 30 metri dal mare, Villa delle Grazie è immersa nel verde tra i pini marittimi. Il piano terreno ospita un salotto con caminetto, tavolo da pranzo e cucina a vista oltre a un bagno con doccia e una piccola camera singola. Il divano del salotto è un divanoletto matrimoniale. Al primo piano ci sono tre camere da letto doppie (un letto matrimoniale, uno francese, un letto a castello) e un bagno con vasca. La camera padronale, che ha un bellissimo terrazzo, e la camera doppia godono di vista sul mare. Villa delle Grazie è dotata di aria condizionata/riscaldamento, televisione e stampante wireless. La cucina è completa di: frigorifero da 350 litri con ampio vano freezer; forno; piano da cinque fuochi; lavastoviglie. Tutte le camere da letto del piano superiore hanno grandi armadi per i vestiti. La villa ha un giardino privato curato e un patio esterno coperto con grandi divani, un barbecue e un tavolo per mangiare all'aperto. La spiaggia di Santa Margherita di Pula si estende per chilometri, la sabbia è fine e chiara, e a riva l'acqua è poco profonda ideale quindi anche per famiglie con bambini. Nei giorni di vento è perfetta per chi ama praticare il surf. La casa si trova a mezz'ora di auto da Cagliari, e a dieci minuti dal paese di Pula. Pierfrancesco, we had a wonderful time at your villa. Thank you very much for allowing us to stay there. We can recommend it to anyone. It is located a stone throw away from the beach (literally). It has everything that a large family would need (kitchen utensils, spare towels, beach equipment, peace and quiet). The rooms are bigger than on the pictures. I think the layout was changed and there 2 good size double bedrooms now, one room with bunkbed and another one downstairs a small single bed. There was enough space for 6 adults and 3 kids. Space outside was great for evening meals (but remember to bring mosquito repellent with you). There is enough space on the driveway for 3 large cars. The car is needed if you want to see the island or go to the supermarket or restaurant. The local beach is great and the house is only 10 mins drive from Chia beach. Pierfrancesco was a great host and even offered us a full refund a week before our arrival as the weather was extremely bad (worst in 20 years) but we decided to go to Sardinia no matter the weather. We were greeted at the villa by Patrizia who explained all we needed to know about the villa. She also provided information on the local supermarkets, restaurants and hospitals (we had a sick child). Sehr schönes Haus, nur ein paar Schritte vom Strand! Wir waren Ende Mai / Anfang Juni für zwei Wochen mit zwei Familien - 4 Erwachsene und 4 Kinder (3, 3, 2 Jahre und 9 Monate) dort und haben uns sehr wohl gefühlt. Das Haus ist sehr schön und gepflegt und Pierfrancesco war schon im Voraus bemüht alles nach unseren Bedürfnissen auszurichten. So standen zum Beispiel bei unserer Ankunft 2 Babybetten und 2 Babystühle bereit! Das Haus ist insgesamt sehr gut ausgestattet. Man merkt, das es ein privates Ferienhaus ist, das auch vom Vermieter selbst genutzt wird und fühlt sich gleich zu Hause. Die Zimmeraufteilung war das Einzige was uns bereits im Vorhinein beschäftigte. Entsprechend der Beschreibung ist das Einzelzimmer im Erdgeschoss wirklich nur für eine Person geeignet. So haben wir uns auf die drei Schlafzimmer im Obergeschoss verteilt. Die Babybetten passten problemlos in die Doppelschlafzimmer! Das Haus liegt am Ende einer wenig befahrenen Sackgasse, so dass auch der Weg zum Strand für unsere 3 jährigen schon fast alleine zu meistern war - aber nur fast ;-). Der Strand war ebenfalls ein Traum und zu unserer Reisezeit kaum besucht. In der direkten Umgebung gibt es hauptsächlich private Ferienhäuser. Vom den wenigen grösseren Resorts merkt man - zumindest in der Vorsaison - nichts. Der Garten ist sehr schön und schattig und wir haben uns in der Mittagspause aus der Sonne am Strand dorthin zurück gezogen. Das Sofa lädt den ganzen Tag zum Entspannen ein. Die Kinder konnten sich auf dem eingezäunten Grundstück frei bewegen und hatten genug Platz zum Rennen und Ball spielen. Insgesamt haben wir unsere Zeit in der Villa delle Grazie sehr genossen! Vielen Dank noch einmal an Pierfrancesco für die tolle rundum Betreuung! Das Haus liegt in einem sehr gepflegten grossen Garten mit wunderschönem Gartensitzplatz und toller riesiger gedeckter Lounge. Das Haus ist gemütlich und liebevoll eingerichtet. Da wir acht Erwachsene waren, war die Zimmereinteilung nicht ganz einfach, da es nur ein Schlafzimmer mit breitem Doppelbett gibt. Aber für Familien mit Kindern ideal. Der Strand ist keine 20 Schritte entfernt. Leider hat hier das Meer in den letzten Jahren einen Teil des Strandes zurückerobert. Aber die Traumstrände von Chia sind mit dem Auto in 10 Minuten zu erreichen. Ein sehr schönes Haus in bester Lage. Der Garten ist ein absolutes Highlight und lädt zum entspannen ein. Leider ist die Villa allerdings entgegen der Auszeichnung nur für max. 4 Erwachsene und 3 Kinder geeignet, da es nur 1 1/2 wirkliche Schlafzimmer und ein Kinderzimmer gibt. Auch die Anfahrt ist nur mit Kleinwägen (mit Coupe's wird es schon spannend) zu empfehlen, da die Auffahrt zum Grundstück sehr eng ist. Der kurze Weg zum Strand und das herrliche Meer entschädigen allerdings sehr viel. Wer nun noch den hohen Preis und Fahrtwege nach Pula, Chia etc. in Kauf nimmt ist hier genau richtig!!! We are very surprised by this review for two reasons: a. the size of the room are well described and the second room with a french sized double bed is defined compact to avoid any misunderstanding. b. Bernhard and his family were only 4 people in total having a space of 2 double and 4 single beds available. This review does not respect the house, the large space for the car ( 2 cars can be easily parked in the internal alleyway and the demanding service/support to Bernhard and his family given by our people during their holiday spent in the proprerty. We are very sorry for this puzzling review that in our opinion doesn't respect the reality. Dear Sara, Dear Jeremie , thank you for your kind words. I am glad that you and your sons enjoyed the time and the magic atmosphere of the south Sardinia. It was a real pleasure to have you as our guest. Look forward to have you back in Sulcis . 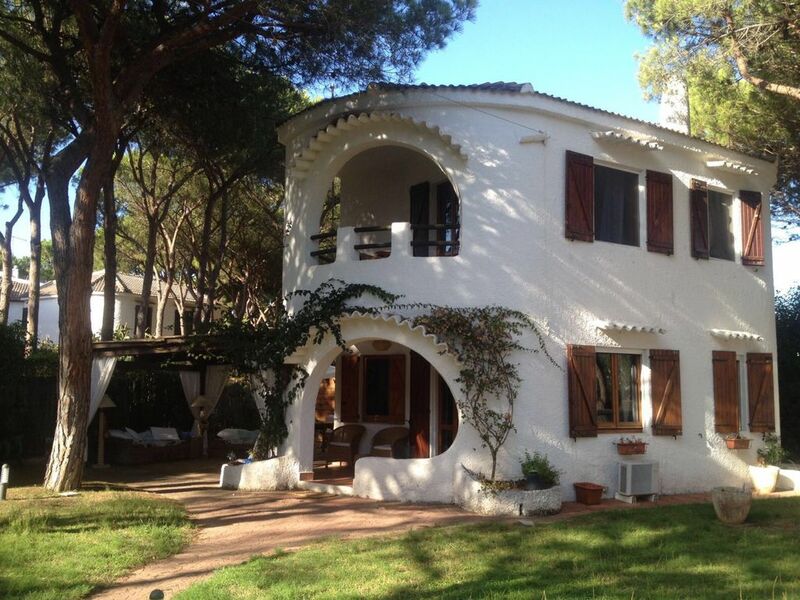 We spent two weeks in April in this nice villa in San Margarita di Pula. The house is well equipped with dish washer, washing machine and everything else you want. Outside is a nice area to take in all meals and listen to the waves clashing at the beach. In the evening a nice outdoor sitting corner can be used. To the beach it only takes 30 meters and the children enjoyed the different opportunities at the beach (surfing and fishing). The place is a great starting point to nearby fantastic beaches in Chia and for hiking tours in the nearby mountains or along the coast. Having brought with us our own bikes for road cycling we enjoyed the panoramic coast road and mountain roads also by bike. The lessor always replied very friendly and promptly to our requests and the housemaid handed over the house as agreed without any complications. The garden is well maintained by a gardener who passes by at least once a week. Overall we had a very pleasant stay in a nice house which we can recommend to anyone looking forward to get to know South Sardinia. We would recommend a car for shopping and the other excursions mentioned. La tariffa non comprende le spese di energia elettrica e acqua che saranno conteggiate al consumo. Da pagare in struttura al check in 350 euro di cauzione, la quale verrà restituita al check out previo verifica e pagamento dei consumi e\o salvo danni. Per soggiorni uguali o superiori ai 21 gg si richiede una cauzione di 550 euro Fee does not include cost for electricity and water. guest will be charged on consumption and at the same rate of the energy and water local provider. at check in a bail of 350 euros is requested and it will be refunded deducted by the cost of electricity and water consumption. Bail of 550 euros is requested for period equal or more then 21 days.